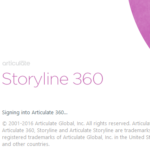 Review: Articulate Storyline 2 – what’s new? 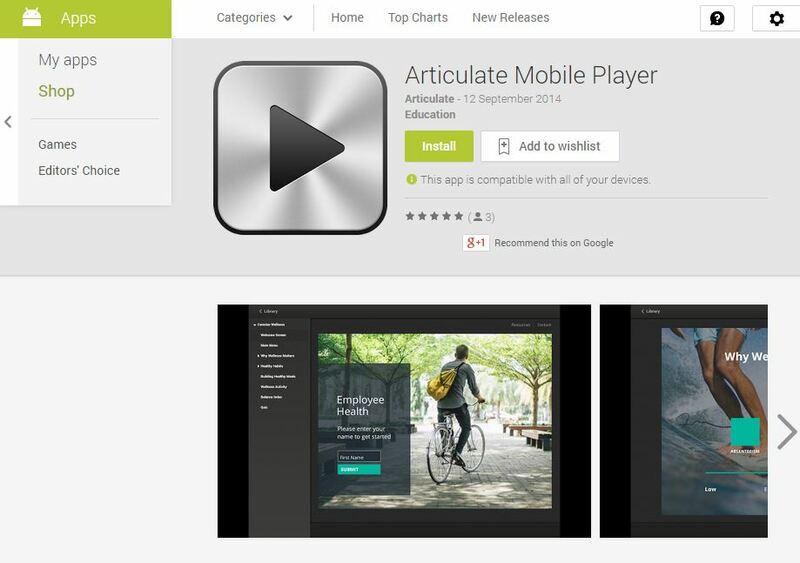 Articulate Storyline 2 is now officially available through Articulate.com and all resellers worldwide. In this review, we take a look at what this version of Storyline brings to the table for learning designers and highlight the main changes from what is now coined, “Storyline 1”. When you first start up your brand spanking new version of Storyline 2, you are prompted with a familiar splash screen containing tutorials and links to open a new or existing project. If you decide to open an existing module created from Storyline 1, you will be asked to upgrade the project to the latest version before you can access it. It comes with a clever built-in back-up tool that allows you to revert back to your original file if the upgrade fails for any reason. 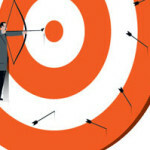 We found the process painless and assuring. A good start! The interface is fully modernised and de-cluttered. We like the ability to move and dock the Triggers and Slide Layers windows as we please, as shown below. In fact, we suspect this new feature is made for designers with multiple screens; de-cutter by moving your Triggers and Slide Layers to a separate screen altogether. The top ribbon remains largely the same. The buttons are refreshed, and some are grouped together under new headings. For instance, the Control button now includes hotspot and data entry. We did not have any problems finding our way around the ribbons and buttons and believe Articulate has done a good job with these improvement tweaks. One of the new features listed under Controls is the addition of sliders. 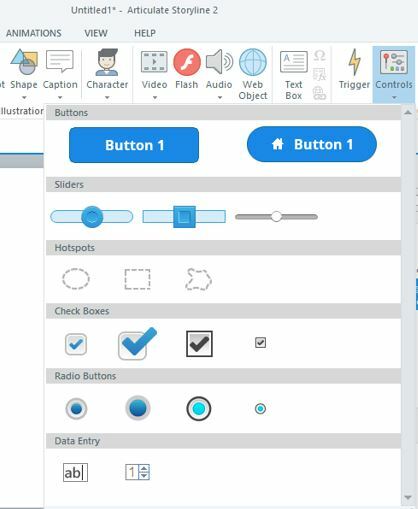 Like buttons, triggers can be set to these sliders in relation to the position of the knobs, which means instructional designers have an alternative way to display contrasting or relative content in an interactive style. 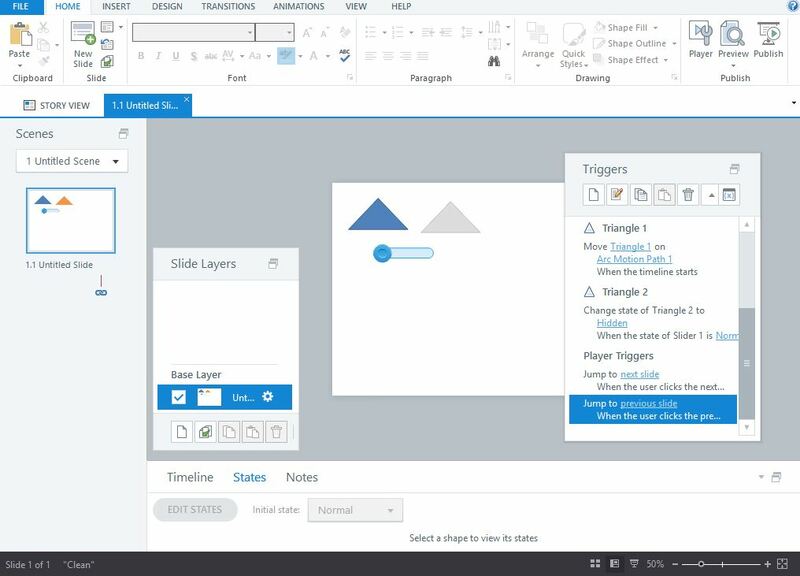 You could create a slider of your own in Storyline 1, however, without out-of-the-box integration with Triggers, it certainly is more time consuming and tricky. Another addition to the feature list is the Add Animation Path under the Animation ribbon. 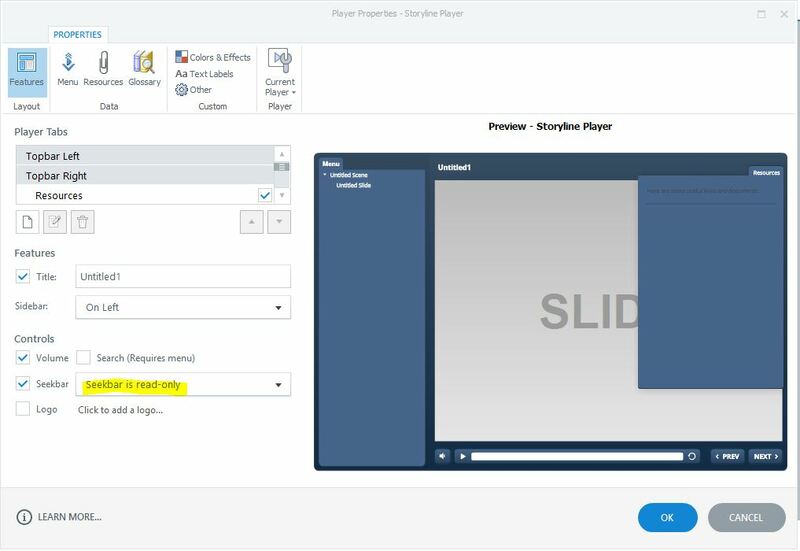 Aside from the standard fly in and fade out type of movements, in Storyline 2, you can control the exact path an object takes and the duration of the animation. Just for good measure, Path Options come with a number of pre-made directional pathways and custom parameters. One of the things we can see us doing more of is creating learning pathways or Venn-like diagrams. To save all of our sanities trying to replicate animation settings to other objects, the new Animation Painter does the trick. It works in the same manner as the Format Painter. 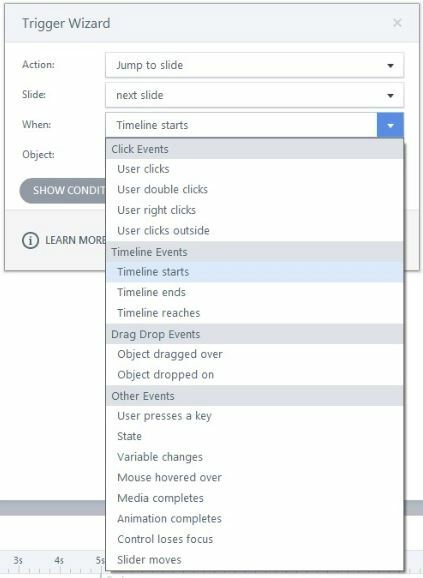 With the inclusion sliders and animation paths to name a few, the Trigger Wizard now lists a number of new events, enabling the same level of control over actions and objects you have come to know in Storyline 1. A much-wanted and long-awaited option to set the seek bar as read-only has finally come to fruition! This enhancement means learners cannot fast forward through slides. Remember the times you have had to go without the built-in Back and Next buttons in Storyline 1 because you could not control its visibility through the Triggers? Those days are well and truly over! The image below highlights the option to change the state of the built-in navigation buttons and do all sorts of wonderful things for the sake of learning (and just quietly, for our “control itch” as instructional designers!). How did anyone live without copy and paste? 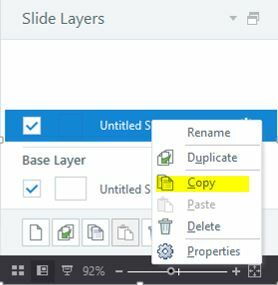 Get your right clicking ready because Storyline 2 layers are copy and paste friendly. A great time-saver. 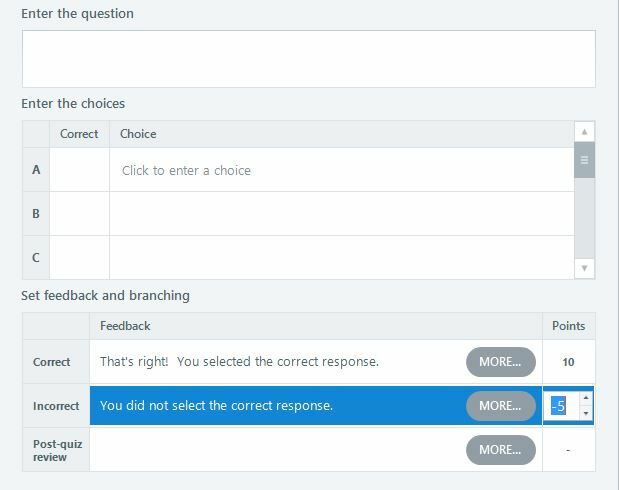 Storyline 2 enables negative scoring in quizzes, which is another welcome feature for anyone needing to penalise wrong answers in their assessments. We have all come across this situation. You are deep in concentration creating some complex slides with more Triggers than you can remember. Suddenly, Articulate Storyline freezes, and you see the dreaded “Non-responsive” warning on-screen. Well, fear no more! Storyline 2 has a built-in auto recovery feature. What this means it that if for any reason Storyine 2 closes involuntarily, you will not lose your work. We have not had the chance to test how well this feature works, but we suspect this is a good thing! The little green man finally gets his or her day in the sun! 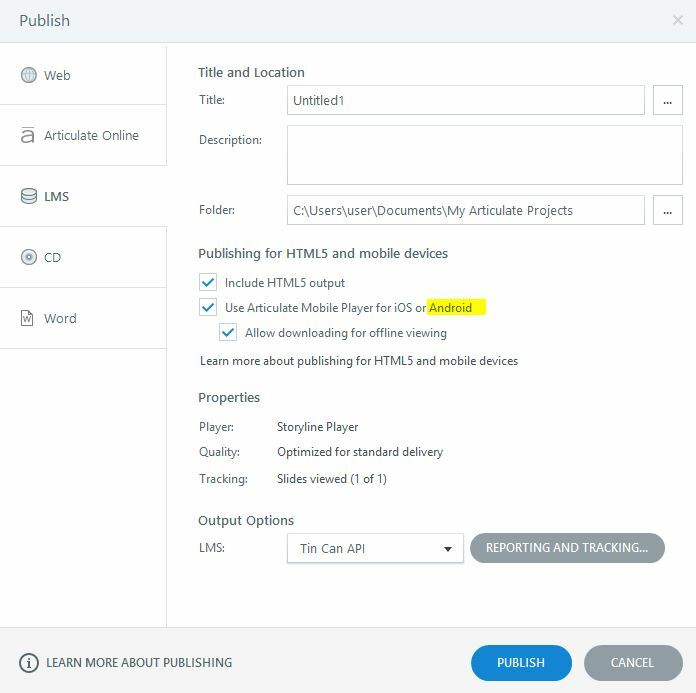 In addition to the existing support for iOS devices, you can now download the official Articulate Mobile App in the Android Play Store to display and run Storyline-made modules. Android Support is reflected now in the Publish window. We like what we have seen in Storyline 2. With the addition of sliders, customisable animation and support for Android devices, it certainly makes sense to upgrade from Storyline 1 if these features are vital to your success. Storyline 1 is certainly not ready to be thrown away, far from it. At the end of the day, it comes down to your individual needs and whether paying for a new licence is worthwhile.